Hedge Planting – Dig Delve – An online magazine about gardens, landscape, growing & making. 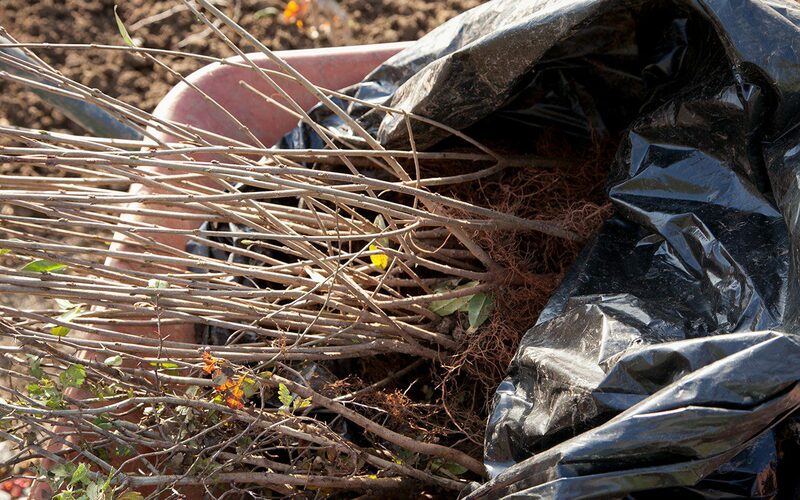 The bare-root plants arrived at the end of November, bagged up at the nursery as soon as the foliage fell from the branches and bundled together ready to make the move to new ground. Just an hour after delivery the roots were plunged in the trough to rehydrate them and then the bundles lined out in a trench in the kitchen garden until I was ready to plant them in their final positions. I love this moment, which marks the transition between the activity of a garden tended through the growing season to the industry of winter preparation. It is now that the real work is happening. 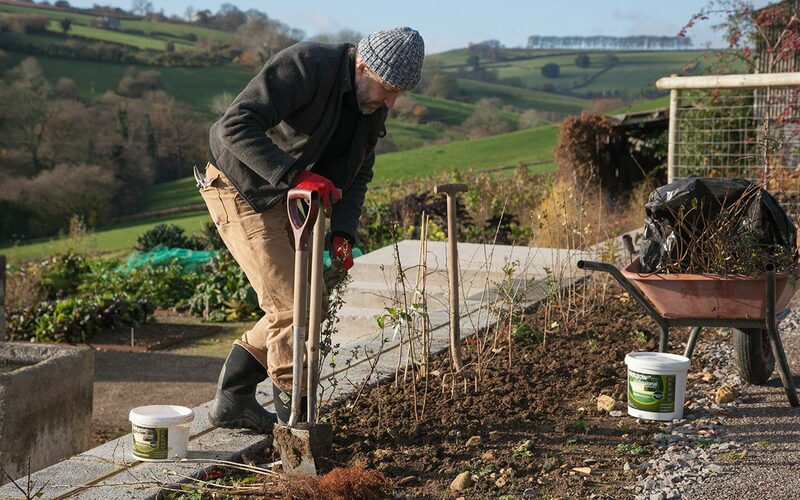 As we turn the soil to let the frost do the work of preparing it for spring planting, or spend an hour shaping the future of a new tree so that its branches are given the best possible opportunity, we imagine the growing garden fully-clothed and burgeoning. I buy my bare-root plants from a local wholesale nursery just fifteen miles from here and welcome the fact that they haven’t had to travel far to their new home. 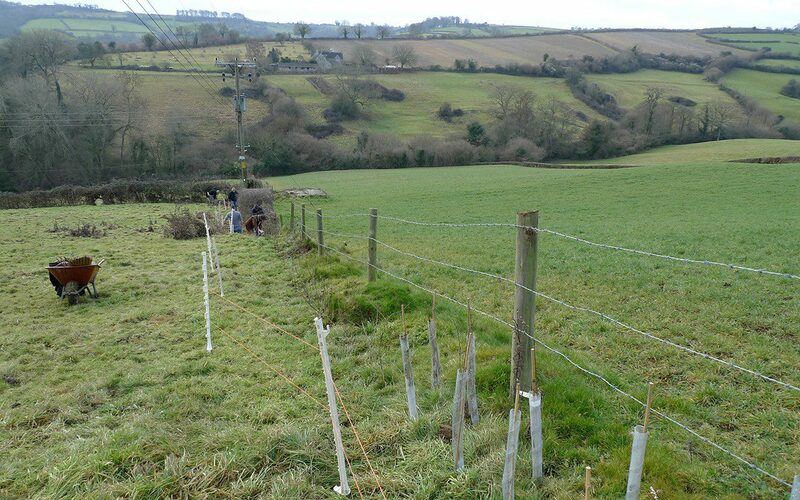 This year the two-year-old whips are the bones of a new hedge that will hold the track which runs behind the house and along the contour of the slope to the barns. It replaces a worn out hedge of bramble and elder that was removed when we built the new wall and will provide shelter to the herb garden below when we get the cold north-easterlies. It will also connect with the ribbons of hedges that make their way out into the landscape. Keeping it native will allow it to sit easily in the bank and to play host to birds up close to the buildings. This year my annual ambition to get bare-root material in the ground before Christmas has been achieved for the very first time. It is best to get bare-root plants in the ground this side of winter if at all possible. They may not look like they are doing much in the coming weeks but, if I were to lift a plant from my newly planted hedge at the end of January, it would already be showing roots that are active and venturing into new ground. With this advantage, when the leaves pop in the spring the plants will be more independent and less reliant on watering than if planted at the back end of winter. Slit planting whips could not be easier. A slot made with a spade creates an opening that is big enough to feed the roots into so that the soil line matches that of the nursery. 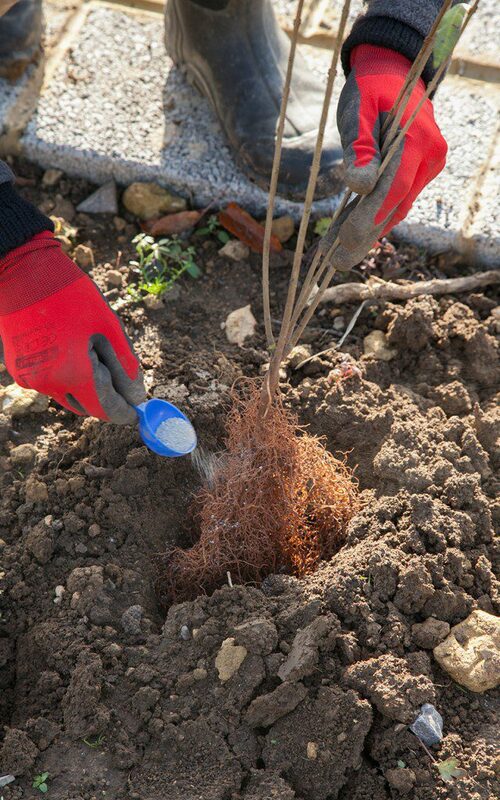 I have been using a sprinkling of mycorrhizal fungus on the roots of each new plant to help them establish – the fungus forms a symbiotic relationship with the roots and mycorrhiza in the soil, enabling them to take in water and nutrients more easily. A well-placed heel closes the slot and applies just enough pressure to firm rather than compact the soil. The plants are staggered in a double row for density with a foot to eighteen inches or so between plants. I have planted a new hedge or gapped up a broken one every winter since we moved here and I have been amazed at how quickly they develop. They are part of our landscape, snaking up and over the hills to provide protection in the open places and it is a good feeling to keep the lines unbroken. This one has been planned for about three years, so I have been able to propagate some of my own plants to provide interest within the foundation of hawthorn and privet. Hawthorn is a vital component for it is fast and easily tended. It provides the framework I need in just three years and the impression of a young hedge in the making not long after it first comes into leaf. 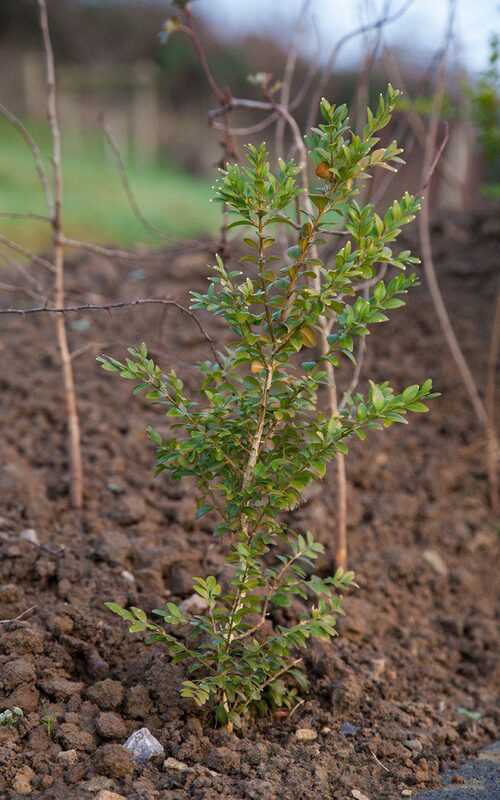 I have planted two hawthorn whips to each one of Ligustrum vulgare, which is included for its semi-evergreen presence. I like our wild privet very much for its delicate foliage, late creamy flowers, shiny black berries and the fact that it provides welcome winter protection for birds. Woven amongst this backbone of bare-roots plants, and to provide a piebald variation, are my own cuttings and seed-raised plants. A handful of holly cuttings – taken from a female tree that holds onto its fruit until February – and box for more evergreen. The box were rooted from a mature tree in my friend Anna’s garden in the next valley. I do not know it’s provenance, but it is probably local for there is wild box in the woods there. I like a weave of box in a native hedge as it adds density low down and an emerald presence at this time of year. Raised from seed sown three years ago, taken from my first eglantine whips, are a handful of Rosa eglanteria. They make good company in a hedge, weaving up and through it. A smattering of June flower and the resulting hips come autumn earn it a place, but it is the foliage that is the real reason for growing it. Smelling of fresh apples and caught on dew or still, damp weather, they will scent the walk as we make our way to the barns. The final addition are part of a trial I am running to find the best of the wild honeysuckle cultivars. I have ‘Graham Thomas’ and the dubiously named ‘Scentsation’, but Lonicera periclymenum ‘Sweet Sue’ is the one I’ve chosen for this hedge, as it is supposed to be a more compact grower and freer-flowering. There are three plants, which should wind their way through the framework of the hedge as it develops and add to the perfumed walk. 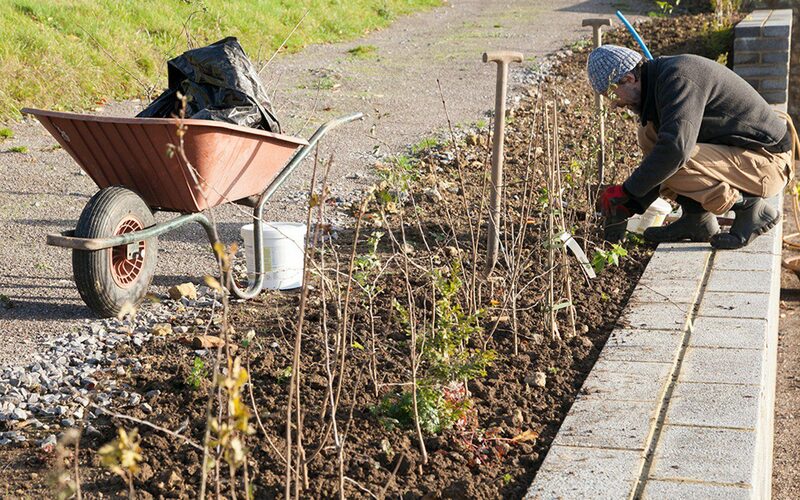 Wild strawberries will be planted as groundcover in the spring to smother weeds and to hang over the wall where they will make easy picking.